If you already have an email account with one of the major providers — Gmail, Yahoo, Outlook, AOL, many Internet providers — you’ll probably be able to add that account to your tablet with just a few bits of information. The Email app already knows the standard settings for them. Tap the Email icon to open the app. To create a new account, tap the Menu icon in the upper-right corner. You see a screen with a panel on the left side with two sections: General and Account Settings. In the Account Settings section, tap + Add Account. 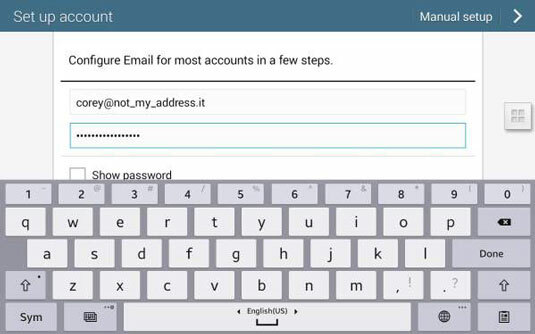 Enter your existing email account and password.